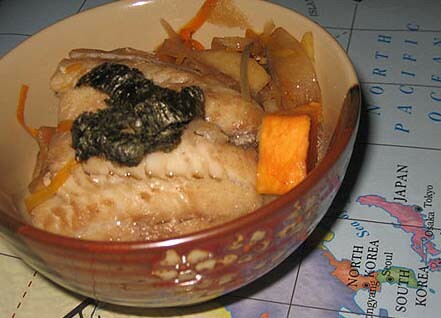 Simmering meats or fish for a long time is what Koreans call jjorim. Usually a soy sauce-based marinade is used to make jjorim stew. This is Nabi’s mother’s recipe but she’s adapted it to make a vegetarian version with tofu. I copied and used both fish and tofu and it turned out to be the perfect bowl to nurse during a rainy day. I julienned a carrot and a radish while I roasted a small sweet potato. I put them all together in a pot with some firm tofu, poured over the soy sauce marinade and topped them with a beautiful cod fillet. The saltiness of the soy sauce evaporated when I put everything into a low simmer; I turned off the heat when the fish was white enough to look tender. 1. Mix and stir all the liquid together with the maple syrup, ginger, garlic and pepper flakes to make marinade. 2. In a Dutch oven, layer all the vegetables and tofu. Pour the marinade into the pot. Add the vegetable stock. Top with the fish. 3. Cover and simmer for about 15 minutes. Top with roasted seaweed. i’m going to have to try this one very, very soon (like in a few hours).